We're proud to have been involved in press mentions and interviews with friends and associates in the content marketing, social media marketing, and flooring worlds and have gathered here, on this page, links to those interviews going back to Simple Marketing Now's founding in March 2009. As with Simple Marketing Now's press releases, these press mentions and interviews give you a sense for the projects and presentations we participate in and our passion for blogs, social media, content marketing and getting found online. We've organized radio interview and podcast content by year. 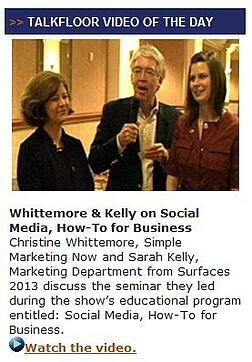 These are the press mentions and interviews that Simple Marketing Now took part in in 2009. Contact us at mailto:info@SimpleMarketingNow.com or call 973-283-2424.